For eleven years, (RED) has served as a way to help victims of AIDS, and this year it’s back, as we don a red ribbon and Apple does, too. There’s a very good chance that if you’ve ever bought anything made by Apple or Beats, you’ve stopped, looked at the colours, and wondered why red was one of the key colours. While big and bright blues and greens used to be a part of what made Apple’s iPod colour options so playful, these days most of the colours are about metallic choices, while red still sticks around. It’s a colour that is full of heart, is vibrant, and punches out a look few devices receive, but it’s also a colour there for a different reason: it serves as a donation to World AIDS Day. In fact today is World AIDS Day, with December 1 marking the day ever year, and getting the ribbons out for people to donate to and wear, helping to support the fight against AIDS. For Apple, that fight arrives in Project Red, the 11 year running initiative that aims to get donations made from people buying (RED) connected gear, which for Apple has included iPods, iPhones, and headphones. In fact in the past year of purchases, customers have technically raised a good $30 million USD for the fund, which equates to 144 million days of medication that can help prevent the transmission of HIV from mothers to unborn babies. Since its inception, the Project Red effort has raised over $500 million, helping to provide testing, treatment, and prevention services in areas of the world where it is desperately needed. “Connecting through our products and services helps make it easy for our customers to join us in the effort to create the first AIDS-free generation,” said Apple’s Lisa Jackson. “By working with (RED) to stop the transmission of HIV from moms to their unborn babies, we’re already seeing a significant impact in areas where help is needed most,” she said. While the $30 million in funds will go to the Global Fund efforts, Apple stores today across the world will get a red Apple for the week, while Apple will make a $1 donation off the back of every in-app transaction or Apple Pay use around the world. In theory, that means the more you spend — both in-app and outside in the real world — the more Apple will donate, which in turn you’ve technically helped. 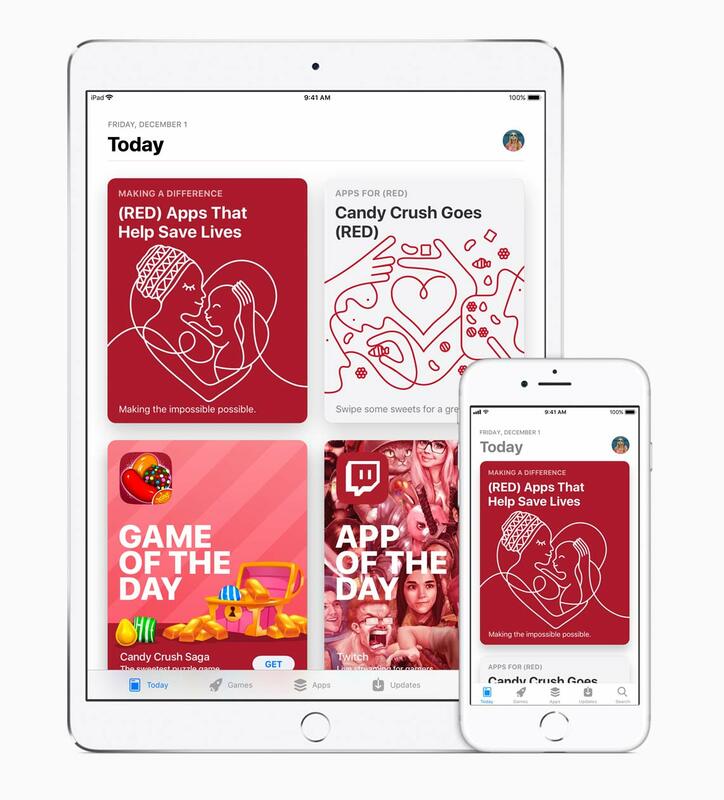 Some apps will even offer Project Red-based initiatives for the day, such as an app tab in the App Store.